I really love all things bread and cheese...think about it...pizza, bagels and cream cheese, brie and crackers, grilled cheese, and pasta--more specifically ravioli. I could never go on a low-carb diet for this reason alone. Luckily, my husband feels the same way...which it why I was DELIGHTED when he suggested we make homemade ravioli. Now, I've never done this before, and I was pretty sure that a pasta maker was necessary, but nevertheless, we decided to go for it. In an electric mixer fitted with a dough hook, combine the flour and salt. Add the eggs, 1 at a time, and continue to mix. Drizzle in 1 tablespoons of the olive oil and continue to incorporate all the flour until it forms a ball. Sprinkle some flour on work surface, knead and fold the dough until elastic and smooth, this should take about 10 minutes. Brush the surface with the remaining olive oil and wrap the dough in plastic wrap; let rest for about 30 minutes to allow the gluten to relax. Note: we added a little more egg and oil to incorporate the dough...we found that this recipe made the dough a little too dry. I think that's the great thing about cooking (as opposed to baking), you don't have to be afraid to improvise if you need to. Combine all the ingredients in a mixing bowl, stirring to incorporate. Easy peasy! Cut the ball of dough in 1/2, cover and reserve the piece you are not immediately using to prevent it from drying out. Dust the counter and dough with a little flour. Now normally, this is the part where you put it through the machine...blah blah. We do not own one of those things so we (and when I say "we", I mean my husband), took a rolling pin and rolled...and rolled...and rolled until it was paper thin. I do not recommend this...poor hubby was sweating and had blisters by the time he was done. Once the dough is ready, beat 1 egg with 1 tablespoon of water to make an egg wash. Dust the counter and sheet of dough with flour, lay out the long sheet of pasta, and brush the top surface with the egg wash, which acts as a glue. 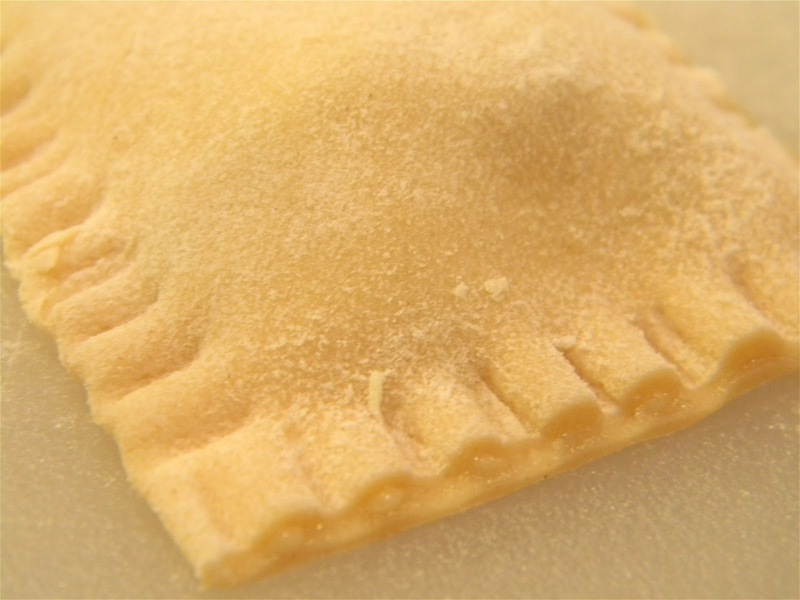 Drop tablespoons of the filling on 1/2 of the pasta sheet, about 2-inches apart. Fold the other 1/2 over the filling like a blanket. Use a sharp knife to cut each pillow into squares and crimp the 4 edges with the tins of a fork to make a tight seal (for the record, I was the crimper). Dust the ravioli and a sheet pan with cornmeal to prevent the pasta from sticking and lay them out to dry slightly while assembling the rest. Cook the ravioli in plenty of boiling salted water for 4 minutes; they'll float to the top when ready, so be careful not to overcrowd the pot. Lift the ravioli from water with a large strainer or slotted spoon. Bathe the ravioli in your favorite sauce* to lightly coat and serve. 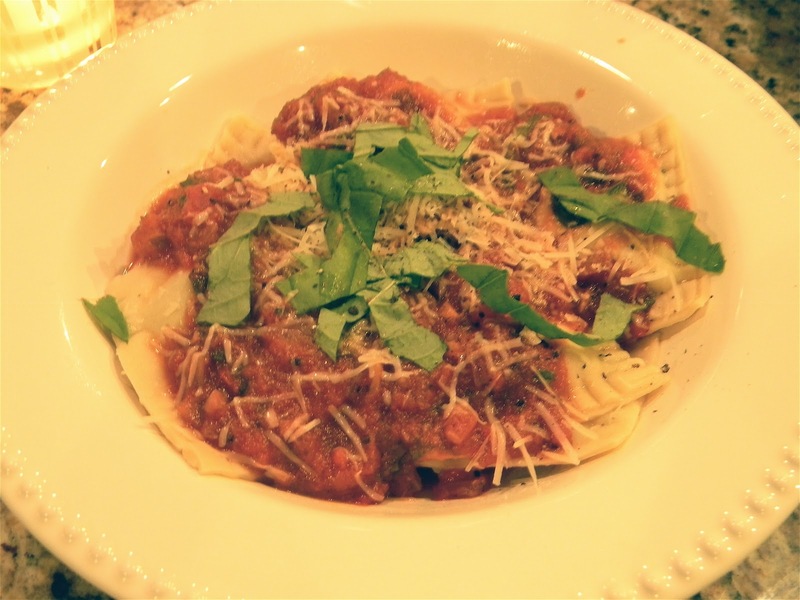 *For the record, we also made the sauce from scratch (I mean, COME ON! You can't make the ravs from scratch and not do the sauce) but we were not overly thrilled with the sauce we made, so use your own favorite recipe. Top the ravioli fresh Parmesan and basil and voila! You're done! Now this seems like a long and tedious process, but it's really not too bad and quite the accomplishment when you're done! Definitely worth making for a special anniversary or date night. It was super delicious!